This sparkling wine is called Blanc de Blancs, which means there are only white grapes used. Did you know that traditional champagne uses some red grapes but with a method that takes the clear juice out and discards the skins preventing it from turning red? When I had Brie in the past I thought it was okay but it’s been fun trying some other soft cheeses. The St. Andre cheese was tart, smooth, creamy, a little funky, and clean. The flavor reminded me of sharp cheddar. Neil thought it was really tart, creamy, and kind of bland. Have the other soft cheeses sounded too intense for you? Maybe this would be a good alternative for you. Click the link to the left so you can try it! 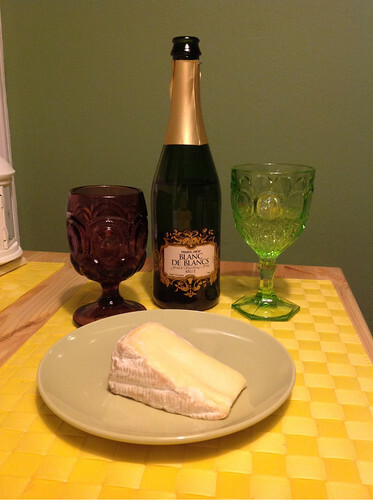 The pairing of Blanc de Blancs and St. Andre cheese was pretty interesting. I found the cheese to make the wine more crisp and Neil noticed the wine cutting through the fat of the cheese. We both picked up on the fizziness being magnified and the wine bringing out the funkiness of the cheese. We both enjoyed this pairing.